Malborne Rangers Under 14s are pictured before their 14-1 win over Hampton Royals. From the left are, back, Daniel Knight, Leon Jordan, Vilian Radic, Ricardo Jamanca, Liam Weston, Derek Weston, Michal Pawelek, Harrison King, Shayne Costen, Steve Rockliffe, front, Ashton Strangward, Oren Spivak, Sam Mee, Jayden Stevens, Sean Knight, Kalani Kenton and Harry Kesson. For some players scoring 10 goals in a season is a big achievement . . . but Vilian Radic did it one game at the weekend. The Malborne Rangers teenage star reached double figures in a 14-1 win over Hampton Royals in Under 14 Division Three of the Peterborough Junior Alliance League. And that took his goal tally for the season to a remarkable 31 from seven games. Shayne Costen (2), Kalani Kenton and Sean Knight were also on target for Malborne, who sit in top spot with seven wins from seven games. Another player on 31 goals for the season is Liam Simper of Hungate Rovers Under 13s. He reached that number with a seven-goal haul on Sunday as his table-topping Division Four side bashed Blackstones Green 16-0. Action from Hampton Royals Under 14s v Malborne Under 14s. Charles Pearce was next best on the scoresheeet with four and Tyler Stokes netted three times. Park Farm Pumas Red Under 12s were the biggest winners at the weekend. They beat Division Three rivals Wisbech St Mary Yellow 17-1 with Cameron Love scoring five and Austin Godding notching a hat-trick. Under 12 Division One leaders Feeder Soccer dropped points for only the second time this season when held to a 2-2 draw at Oundle, for whom William Barnes and Ollie Hall scored. There were a couple of shock results in the second round of the Peterborough Youth League Under 15 KO Cup on Sunday. Alton Strachan and Keelan Walker were the heroes as they scored the goals for Division Two side Baston in a 2-1 win over Division One team Yaxley. 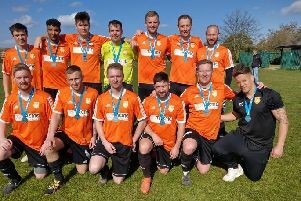 And in another Division One v Division Two tie, Park Farm Pumas Blue were beaten 4-1 on penalties by lower level Stamford Red after a 2-2 draw. Oliver Little and James Millar got the Stamford goals. Biggest winners were Holbeach United Yellow, who beat Stamford White 12-0 with James Clark and Jack Cunnington both smashing hat-tricks. Peterborough Sports Under 18s did their Division One title hopes a power of good when thrashing big rivals Yaxley Lynx 7-0. Jordan Giddings (4), Eunis Lievins, Nkobi Thabani and Jack Martin got the goals to inflict a first defeat of the season on Lynx. Lynx had Billy Robinson sent off for receiving two yellow cards.